This a home-made DVD. A Helen compilation DVD. Painstakingly remastered from my own collection using the best available source for each song. Some are rare or hard to find. Others are well known, but all have never looked or sounded as good as they do now. Careful thought was given to song placement on the DVD so that each song would flow nicely to the next. Even the menus have special background music. Thanks PC! I think all Helen fans will enjoy this DVD and will want to add it to their collection. This is the first of a series. 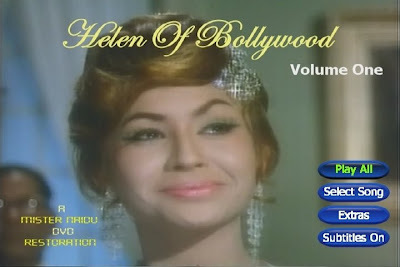 Helen Of Bollywood (Volume One) will be released as a torrent on Bwtorrents.com on 4-24-09 in the "Music Videos DVD" section. Registration is required. Grain and compression artifacts have been greatly reduced! Video has been sharpened, brightened and color corrected as needed. Added where needed (Apradh, Afsana, Sholay). Retimed when needed (Gomti Ke Kinare). Distorted audio has been replaced with better source (Mere Jeevan Saathi, Dus Lakh). Hiss has been reduced and normalization has been applied to all. I hope you'll like it. Lots of time and effort went into this labor of love. This looks promising. 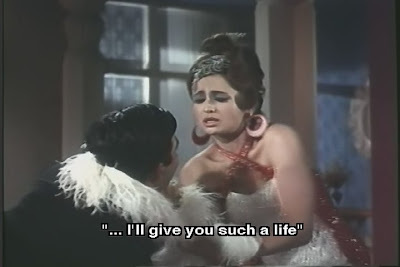 Do you know of a song called Mashooka where Helen is dancing with Ranjit and a bunch of other dacoits? I can never find the video. Ramneek, do you know the movie's name? No clue man. I thought you might know. If I found out, I'll tell you. Hey Mister Naidu, so I just download this, burn it and it'll work on my DVD player right? yup. I tested it on different players. Also, plays on a pc with PowerDVD. 59 people have downloaded it already. Awesome man. Thanks for all the work put into it. I just have 3 hours left in the download. I really look forward to seeing this and once again, I appreciate the effort put into this project. I started watching it and it's amazing stuff. Great job! I haven't heard the majority of these songs. Hey do you know how to become a member of Bollywood Torrents without donating? My credit card doesn't seem to work. The site keeps saying that I can't use it and I'm not familiar with Paypal. thanks for the nice feedback! I just sent an invite to the address I got from your blog. Enjoy! Wow, thanks man. I really appreciate that. Wonderful stuff, looking forward to future volumes! any ideas for those of us w/o a bw torrents membership? PC, glad u liked it.. More on the way! Also, thanks for your rips and scans...they added a nice final touch to the DVD. Hi! Thanks for making this! Do you have a direct linkt to the torrent? Or can you introduce me as a member? All the best, Johanz. Sorry, I don't have a direct link and I don't have any more invites for Bwt. They only gave me 5. I believe you can become a member with a $10 donation without an invitation... or you can wait and see if they have free registrations again. How do I download your dvd? Isn't it this one available in Mediafire?! I've already downloaded all of the Helen DVD except this one. Please upload this one too in mediafire. This is probably the best one i guess. One thing about the song ''Aa Jaane Jaan'' from Inteqam that is it the full song? Does it have that same big and weird ULTRA logo or from another good source? Please inform. Not available on Mediafire yet...eventually. thanks for all the painstaking work you have done for this great artiste. i have a problem. i downloaded all 21 parts ( rar files ) from media fire .i am unable to extract the image as some files are named helen of bollywood (volume 2).part07.rar , but when i donload the file downloaded is helen of bollywood (volume_2).part07.rar. note the _ in volume 2. i am unable to solve this problem even when i rename the files. pls advice. (volume_2).part07.rar as you claim that you are getting. I suggest you delete any part 7 files you've downloaded and try again. If you're still having the same problem then you must download all the par2 files that I provided to repair...refer to the "Instructions.pdf" and "Read first.txt" files on how to use them. I'm on a MAC OS X system...what's the best way to access this DVD? I love Helen. Many people have been able to download for free with Mac OS X at Mediafire @ http://www.mediafire.com/?q1jnhfz3acpq7. Or you can also download the torrent at the with Xtorrent @ http://www.xtorrentp2p.com/ You have to join Bwtorrents @ http://www.bwtorrents.com/ where membership may be required and go to the Music torrents - Music Video DVD section. Good luck! This is a great DVD. I must admit your blog is a real treasure chest and want to thank you for your continuous work! You're the first one to discover my Upaasna secret...lol. Nice work. Now, tell me where my name comes from? one question 2 ask that is the song 'meri jawani' from upsana is complete? i mean that is the 1st shower scene,den she comes in the audience flirting and teasing the mens and then she dances up to an storm wearing that purple dress included here in this dvd? or that just started from the song part? plz inform.